1 of just 5 graded! This 1951 is a rare breed with an obverse boasting ULTRA CAMEO PERFECTION! 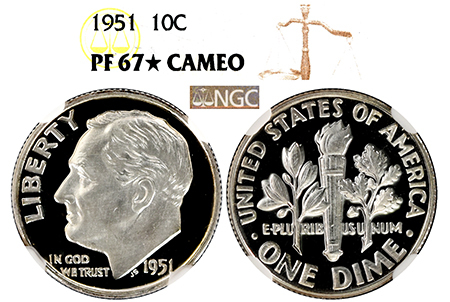 Only 12 total 1951 Roosevelts achieved Ultra Cameo status by NGC, demonstrating how scarce heavy ultra cameo contrast is for this year! Roosevelt sits on deep, pitch-black, haze-free, and flawless-to-the-eye mirrors buried under ten feet of frost! It’s incredible to find a 1951 with this kind of eye-appeal! The reverse is painted in cameo snow with matching mirrors to those found on the obverse. A phenomenal, RARE year for Roosevelt in this condition!